Whatever happened to Catherine Crick? OK, so a title to tease your imagination. Who the heck, you’re probably wondering, is or was Catherine Crick? The journey on which we have embarked in search of the roots of music-hall was initiated by our need to prepare for this weekend’s performance at the Milton Keynes Museum Victorian Weekend on the theme of “The Rise and Decline of Music Hall”. And began, almost arbitrarily, with the Cyder Cellars in Maiden Lane as an instance of a ‘song and supper room’. Who’d have imagined that so simple a quest would have led us on a picaresque journey into inter alia the Minutes of Evidence of London’s Central Criminal Court, and to the case (on page 685) of the stolen spoons, &cet? For the 23 year old Catherine Crick was a servant girl in the employ of William Rhodes, proprietor of the Cyder Cellars, and brother of John Rhodes, proprietor of the Coal Hole, a song and supper room in Fountain Court, off the Strand. Found guilty (and guilty she patently was), she was “transported for seven years“. I’ve found no record of where she would have been transported to, though it would have been to “the colonies” and this would generally be to Australia. Better than hanging, I suppose. but that’s another beguilingly Dickensian story; and one that, I fear, would lead us too far astray from our investigation of the roots of Music Hall. But of course there’s a serious point in our doing (and then publishing) this kind of research: it places the music, the music halls, the audiences, in their historical context. Radio Days is not about ‘old songs’ but about living history. I know what happened to Catherine Crick – she was my 4th Great Grandmother and yes – she was transported to Australia -she left two children behind who were sent to the poor house and then she gave birth to a daughter on her voyage in 1839 who later died in the Hobart Nursery. Catherine was then placed in a ‘Female Convict Factory’ in Hobart where she was eventually assigned to work as a servant for a Doctor. She went on to marry another convict and had a daughter, who I am descended from. She had several children and relationships – and changes of name – and we lost her again – assume she died in either Tasmania or Victoria (where some of her children moved to). Crikey! Thanks for writing, Lynda, and how amazing that you should have come upon our blog and been able to bring a bit of history into the present! 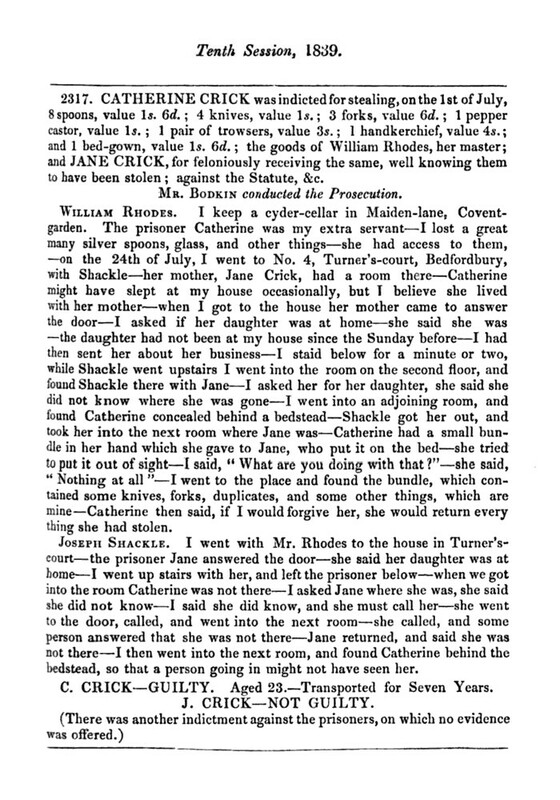 I am also related to Catherine Crick, My 3 x Great-Grandmother by Thomas her son who was left behind mainly to be brought up in the workhouses of London, unfortunately his sister Elizabeth died. Thomas and most of his decenants have lived in or around London. It might interest you to know I am in contact with Lynda, I tracked her down through Ancestry and DNA. It was really great to come across your article about the Cyder Cellar and Catherine. I’m so pleased, Jan, that you and Lynda came across my little blog piece on Catherine Crick and the Cyder Cellar. One never knows at the time of writing who, if anyone, will ever read what one writes, so it’s tremendously rewarding for me to know that the two of you found and appreciated my article.